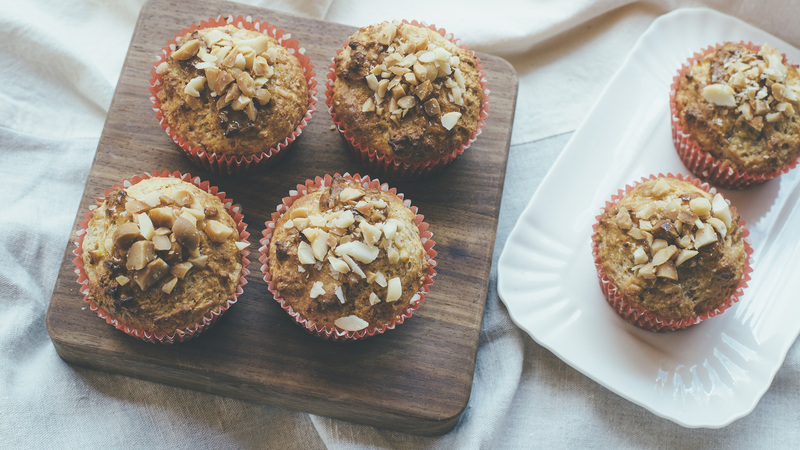 Soft, sweet and wholesome, these muffins are a bananalicious treat. 1. Preheat oven to 200°C fan forced. Line a 12-hole 1/3 cup capacity muffin pan with paper cases. 2. Sift flours, baking powder and cinnamon into a bowl. Stir in macadamias, sugar and desiccated coconut. Make a well in the centre. 3.Whisk banana, 1/4 cup honey, oil, eggs and yoghurt in a jug. Pour into well and gently fold until just combined. Three-quarter fill muffin holes with mixture. Bake for 15 to 20 minutes or until a skewer inserted into the centre comes out clean. Stand for 5 minutes in pan then turn onto a wire rack. 4. Heat remaining honey in microwave on high for 20 seconds. Brush tops of warm muffins with warm honey. Sprinkle with the roasted macadamias.